Baghdad has launched a military operation in the northern province of Kirkuk, disputed by both the central government and Iraq Kurdistan, following the province's participation in the September 25 referendum on the autonomous region's independence. MOSCOW (Sputnik) — The Iraqi armed forces managed to capture strategic positions in the Kirkuk region, which held the vote on the Iraqi Kurdistan's independence too, despite not being a part of the region. Baghdad has refused to recognize the results of the referendum, which was held in the autonomy and other territories that are claimed by Erbil and de facto controlled by Kurdistan's military forces, Peshmerga, although not within the autonomy's official borders. Shortly after the referendum, the Iraqi parliament approved the government's decision to deploy troops to the oil-rich Kirkuk province. Iraqi Kurdistan's vice president said Friday that Erbil would send 6,000 Peshmerga troops to Kirkuk to counter Baghdad's plan to retake control of the area. Local media reported earlier on Monday that 3,000 Kurdish Peshmerga had been additionally deployed to Kirkuk. 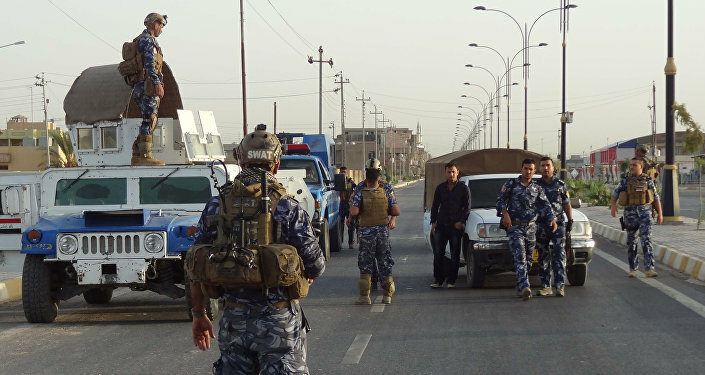 Iraqi federal police officers entered the Kirkuk administration building earlier on Monday, meeting no resistance, a source from the local government told Sputnik. The central government forces have also occupied several other important facilities in the city. Most regional officials, including governor Najmiddin Karim, had left for Kurdistan. 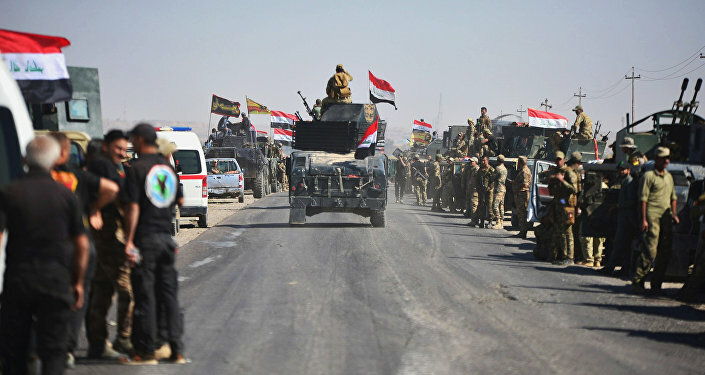 The Iraqi government said that its forces had been instructed to secure bases and federal facilities in the province of Kirkuk. The government also said that Prime Minister Haider Abadi had ordered the Iraqi Security Forces to cooperate with Peshmerga and protect civilians. Hemin Hawrami, senior assistant to Kurdish President Masoud Barzani, said that Peshmerga had clashed with the Iraqi forces attempting to enter the disputed region and pushed them back. Hawrami went on to add that Barzani had also instructed Peshmerga not to initiate altercations and only act when the other side begins the assault. 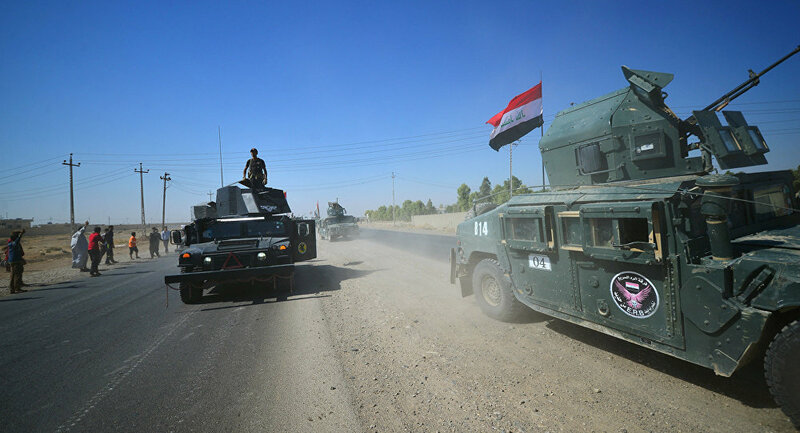 The Iraqi army command issued a statement saying that the Iraqi troops had secured control over the K-1 military base, Baba Gurgur and Bai Hassan oil fields, as well as Kirkuk's irrigation system. The leadership of the Iraqi Kurdish Peshmerga paramilitary forces said later in the day that the attack on Kirkuk could be considered a "declaration of war" on the Kurds. Nada Khal Khamza, a lawmaker in the Iraqi parliament, a member of the Kurdish coalition, told Sputnik that Baghdad was acting "undemocratically." "All actions to boost military presence will only lead to the escalation [of the conflict], but not to the solution of the problem… It seems as if the Iraqi government does not want to hold a dialogue with Kurds," the lawmaker said. According to a lawmaker from Erbil, Tariq Sadiq Rashid, the situation is likely to change at any moment, but "the military power will now play the most important role." Khamza said, however, that Iraqi Kurdistan was still advocating for all parties to sit down at the negotiating table. Pentagon has urged both Erbil and Baghdad to avoid further escalation of the conflict, stressing that the United States supports "a unified Iraq." "We strongly urge all sides to avoid additional escalatory actions. We oppose violence from any party, and urge against destabilizing actions that distract from the fight against ISIS [Islamic State, Daesh, a terrorist organization outlawed in Russia] and further undermine Iraq's stability," Laura Seal, a spokeswoman for the Department of Defense, said on Monday in a statement. According to media reports, representatives of the US-led coalition tasked with fighting Daesh, have met with representatives of Iraqi Kurdish militia to discuss the ongoing conflict. Russian presidential spokesman Dmitry Peskov said Monday that Moscow supported a peaceful resolution of the conflict by political and diplomatic means. The Turkish Foreign Ministry said Ankara was ready to help Baghdad drive Kurdistan Workers’ Party (PKK), listed as a terrorist organization in Turkey, out of Iraq. On Sunday, the security council of the Iraqi government claimed that Iraqi Kurdistan had summoned non-state armed forces, including the PKK, to the disputed Kirkuk province, and suggested that the move might be seen as the declaration of war on Iraq. Erbil promptly refuted the allegations. Moreover, Ankara has decided to close Turkey's airspace for Iraqi Kurdistan amid the ongoing fighting in Kirkuk.